Evaluate assets on a wall with multiple votes! The Room Owner can add up to three evaluations per wall at one time. Room Owners/Moderators have the ability to create evaluations on one or multiple walls in a room. As a room participant they are asking you to evaluate all items on the wall with votes. Evaluations are highlighted on the Overview page whenever they are active. 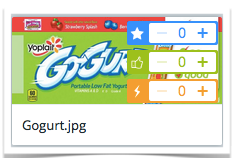 Click on the evaluation name and you will be taken directly to the wall. The evaluation statement will show at the bottom of the page detailing the votes you have remaining. Scroll over each asset and your evaluation buttons will appear. Click (+) to vote give your vote to that asset. Want more details on how each evaluation is set up? Click on the Toolbox button to obtain all the wall details. Want to set up an evaluation in a room you own? Go to Create Wall Evaluation for directions on how to set up your room evaluations.